Are Your Bath Towels Really Clean After Washing? Washing a bath towel seems pretty simple. But if you end up with stiff or scratchy towels or one that have funky smells, you have some problems. What about those mysterious dark grey or brownish-orange stains that appear on washcloths that won't come out and towels don't absorb water well. What's going on? Help is here and all it takes to have nice, clean towels is knowing what causes the problems and learning how to properly wash bathroom towels and washcloths. You've washed your towels and they smell pretty good as they come out of the dryer. But the minute they get damp, the funky odor returns. This is because the towels were not really clean. One of the main causes of the odor is that your washer is not clean and body soil and bacteria are redepositing on the terry cloth during the rinse cycle. The very nature of the weave of terry cloth is that it has a dense pile or longer fiber length to absorb liquids. If the liquid itself is not clean, that is what is being reabsorbed by the terry cloth in the rinse cycle. Begin by giving your washer a good cleaning. The build-up of soil and leftover detergent and fabric softener can happen in top load washers but is most common in front load washers which use less water. Front load washers are also prone to have standing water inside after a cycle and this can lead to mildew odors that transfer to thick, absorbent fabrics. Once your washer is clean, you can then tackle the odor in the towels. Begin by washing the towels in a hot water cycle but do not add any detergent. Instead, add one cup of distilled white vinegar to the wash load. The vinegar will help strip away the build-up of detergent, body soil, and fabric softener caught in the fabric. Finish the process with a second wash in hot water with your regular detergent but do not add any fabric softener. This will leave them smelling fresh and clean even when damp. Use hot water each time you wash towels. Use a heavy-duty detergent (Tide and Persil are leading brands with enough enzymes to effectively remove body soil) that cleans well. Be sure the towels are thoroughly dry before folding and storing. If your towels are not as absorbent as they once were, the culprit is fabric softener build-up. Most fabric softeners use ingredients that coat fibers to make them feel softer. Those same chemicals that make the towel smooth to the touch also repel water. To make those towels do their job again, wash in hot water with a heavy-duty detergent and add one cup of distilled white vinegar to the rinse cycle. The vinegar will help strip away residue build-up and leave your towels naturally soft. When buying towels, look for 100 percent combed or ring-spun cotton. These towels will be more absorbent and durable than other towels. If mysterious grey circles appear on your washcloths and not other bath linens, it is your soap. Certain brands, especially "natural" soap, body wash or liquid soap, react with some types of water and leave a residue on the washcloth. To remove the stains, make a paste of powdered detergent and a bit of water and work it into the stained area. Let it work for at least 15 minutes and then wash in hot water as usual. Boiling the washcloths in a pot of water will also help remove the residue. Unfortunately, each time you use the washcloths with the same soap, the grey stains are going to reappear. If a change of bath/face soap is not a possibility, you will probably want to switch to a dark-colored cloth. If you have white or light colored towels, they will turn dingy if you don't use hot water and a heavy-duty detergent each time you wash them. You also need to sort your clothes well. Washing light colored towels with blue jeans will not keep them looking great. To restore their brightness, follow these tips for whitening. Those brown or orange stains are probably not rust. They are usually caused by make-up, acne medicine, sunscreen or self-tanners. Acne medicines and some other facial products also contain bleaching agents that will discolor towels. Once the fibers are bleached, the color cannot be restored. If you use acne products, white towels are much more simple to maintain. Take time to pretreat the stains from makeup and sunscreen before washing, because they will be much more difficult to remove after going through a hot dryer. If you have hard water and don't use a water-softener system, your water can be causing mineral deposits to build-up in the fibers of your towels. 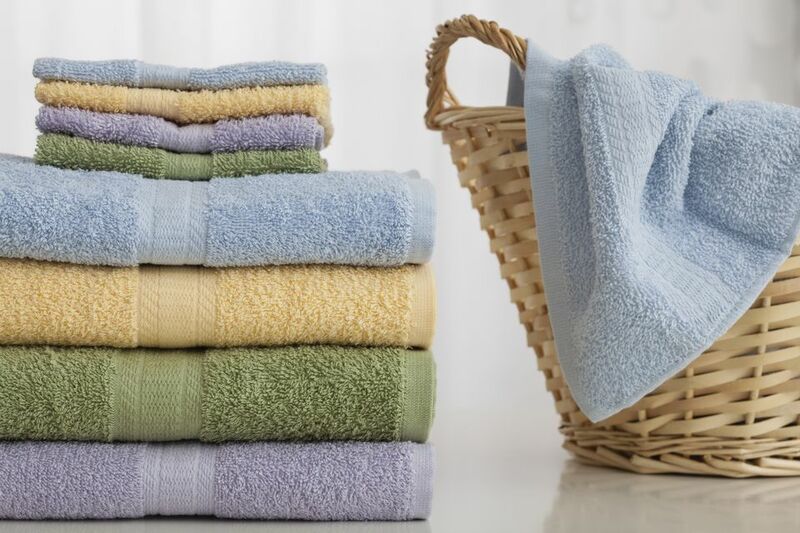 To make them soft again, wash the towels with a hot water cycle with one cup of household ammonia. DO NOT ADD ANYTHING ELSE. Combining other products with ammonia can cause toxic fumes. If you don't live in an area with hard water, the stiffness is coming from a build-up of detergent residue and other laundry products (fabric softener). Again, wash the towels on a hot water setting but add NO detergent. Be sure that you are not overloading the washer so there is plenty of water to lift and carry away the residue. Repeat if necessary.